It was cursed from the stage. It was maligned from the audience. For a lucky few it was a handy leaning post. And now the pole that used to block the view of the stage at the Paradise rock club on Commonwealth Avenue has been rendered moot. 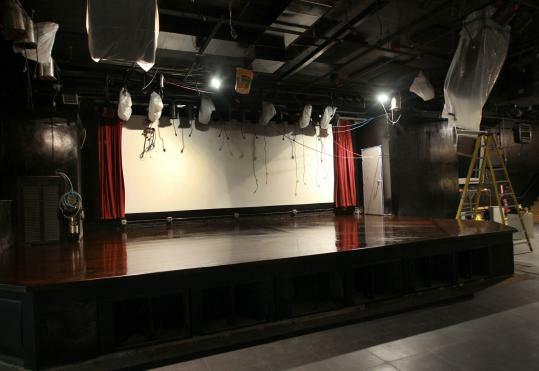 In the most visible and welcome of the renovations done to the venerated 33-year-old nightspot, which reopens Wednesday after a three-month remodel, the stage has been moved 15 feet to the left as the audience views it. That means that the meat of the performance space now lies squarely between two support pillars, one of which may have been the most remarked upon obstruction in Boston rock history. When longtime production manager Billy “Bud’’ McCarthy told people the club was closing for renovations “I’d say 90 to 99 percent of the people would say, ‘Wow, you’re moving the pole?’ ’’ he says with a laugh. Moving the pole itself was not an option for structural reasons, but moving the stage was. But Dunne, who bought the club 2 1/2 years ago with Old Trafford Inc. partner Declan Mehigan and concert promoter Live Nation — whose half was later bought out by Don Law’s Boston Opera House Ventures LLC — also felt a reverence for the stage itself. Having been an avid Paradise attendee since moving from Ireland to Boston in the mid-’80s, Dunne preserved the right side of the original surface. “It probably would’ve been easier just to build a new stage, but because of all the old artists who walked on the old stage we wanted to keep that,’’ says Dunne of names like the Police, U2, the Pixies, and other bands who trod the Paradise boards. The official capacity remains 728 but the possibility exists that the new configuration could earn a higher number from the city. That wasn’t the motivation, say the men. “Basically we wanted to make it better for the artist and the fan,’’ he says. A host of other upgrades have also been made that may be less visible to fans and bands but probably will be welcomed by both. A new fire escape means not only another safe egress but a place under which bands can store gear that would have been placed on the floor, blocking access to the stage. HVAC improvements mean better flow of air conditioning. A ramp has been installed at the entrance improving wheelchair accessibility. The men promise a new coat of paint in the restrooms. The artist green rooms — now outfitted with television and refrigerators — have moved to the second floor and more than doubled in size, with a separate space provided for opening acts. And a restroom (complete with shower) has been installed next door to the dressing rooms. (Previously artists had to use the public facilities.) Of particular note is the new washer-dryer combo. “All the bands that come through are always looking for the nearest laundromat, so we figured, why not,’’ says Mehigan. A look back at some memories of the old Paradise and what to expect of the remodeled club.